Is Scottish Childrens Lottery Legit? Read 25 Reviews! Are you looking for a regular raffle to play, plus live in Great Britain? The Scottish Children’s Lottery is an interesting combination of winning prizes and helping several charities. 30% of each lottery ticket goes directly to one of the charities this lottery supports. Players select their favorite five numbers between 1 and 49 or simply go for a quick pick. Next decisions is whether you want to play both Monday and Thursday, and then whether you want to choose to play 1 to 8 weeks. Subscriptions are also available. Keep in mind there is a £100 cap on the amount you can spend at any one time. The lottery game is available both on your computer and as an app on your smart phone. One ticket for one draw is £1. Pick all five numbers correctly and the jackpot prize is £25,000. There is a five tiered prize chart going down from 4 numbers plus bonus ball to win £2,000, to 2 numbers for a fast pick entry. If there are say 4 or more jackpot winners, it’s capped at £100,000, that amount is divided among the winners. There is also a £500,000 capped for the total amount of prizes paid out on any single draw. Winning the 2 to 5 tier level, the prize is paid directly into your account or for direct debit people, it is paid into your bank account. I’m not exactly sure how they’d pay the 5 tier prize of a fast pick lottery ticket. Win the jackpot and there is further documentation that the Scottish Children’s Lottery asks for prior to paying it into your bank account. Prizes are delivered within 14 days of any request for additional documentation. Prizes must be claimed within 180 days of the draw. There are fourteen different instant win games with jackpots ranging from £25,000 down to £500. They have some inventive names with my personal favorite being Dragon Scrolls. First and for most, players must be both a resident and physically located in Great Britain to play this lottery. Players must also be 16 years or older, have an account with scottishchildrenslottery.com and buy a ticket. The terms and conditions are fairly straightforward and seem to address all the areas of how to play their game. Who Is Scottish Children’s Lottery? A bunch of charities got together and appointed STV ELM Limited to operate this lottery on their behalf. They have a snail mail address in Glasgow, email address and telephone number. Customer service is available Monday and Thursday 10:00 am to 9:00 pm, and Tuesday, Wednesday and Friday from 10:00 am to 6:00 pm. They are closed weekends. ScottishChildrensLottery.com currently supports four charities: Chance to Succeed, Chance to Study, Chance to Flourish and Chance to Connect. Each of these supports the development of Scottish children. Every week on a rotational basis, a different charity is the beneficiary of at least 30% of ticket sales. If you like in and are currently residing in Great Britain, this looks like a fun way to support children’s development and get in on some lottery games or instant wins – and potentially win some money. The Scottish Children’s Lottery gets a thumb’s up. You’re not going to become a millionaire playing here but it is a nice combination of the chance of winning plus supporting some good causes. Where can you see ‘winners’ specifically the top prize of £25,000? Does someone win every week? Been playing this since it started, won once. Other lotteries declare big wins. This isn’t exactly a dig at the lottery but I find it strange that when I paid for a couple lines by debit card, most times I won a pound except once when I won 25 pounds. Then when I chose to pay direct debit I’ve not won since. Also when I tried to use my free 8 pounďs for setting up direct debit the site had a problem and my time ran out. 30pence of my pound would go to charity. Where does the other 70pence go? Think you’re a joke and would like to see your accounts. Won £25 twice now and only a pound to play. Who needs the national lottery? I’ve only just signed up so haven’t won anything yet. But a pound a ticket is good. I like being able to sign up through direct debit, which was really easy. 30p to charities doesn’t seem a lot but it’s 60p I (to be totally honest) probably wouldn’t give every week otherwise, and it stays in Scotland and helps Scottish children. The normal lotto is twice the price and I’ve never won more than a lucky dip in the 5years I’ve been playing. I think this is a great lottery. A great Scottish Lottery. Jackpot should maybe be higher but 25 grand would day me! So much cheaper than national lottery and benefits oor bairns as opposed to England!!! Only a pound to play & i won £250 on a free play. Happy days!!! Customer service were dead nice & helped explain how to use the free codes they send in emails too. Yeah, Joe, I am with you on this topic, this phrase they have ‘what are you waiting for’ does my head in something rotten, it’s so annoying esp the female voice. I would also like to know how much their advertising bill is. No clear information as to how much of each pound they give to charity. 4 non-descript unknown ‘charities’ they’ve decided to form themselves with very loose descriptions. No information easily available as to who the charity CEO or director is, and how much money they earn as a salary or income. They don’t answer emails or address online criticism, instead either ignoring altogether or removing or denying altogether negative comments from their social media sites. And finally, who pays STV for all the advertising of the Scottish Children’s Lottery? As I’ve been told that the charity generated a substantial advertising income for STV from this charity. This is perhaps where the believed £0.63p in the pound expenses/admin goes – boosting STV income and paying off their debt. £37p in the pound to the actual charity with its extremely vague beneficiaries is NOT a good amount. Will STV come clean and restore the public’s confidence? Or does it take an official complaint to OSCAR and representations to MPs and MSPs to get any answers from them? Hiya Craig Dunain, you have magically read my mind, they seem to be never off S.T.V I would love to know what was spent on advertising but, at least we do not have to listen to their constant repeats, (I won £25000.00 with my first ticket) I was sick listening to him 🙁 and who came up with the novel idea of giving a free £7.50 if you paid by direct debit, where did the 50pence come from? To entice you to add another 50p? Seems like quite a lot of charities who have been awarded donations! Would like to know who the CEO is though, I bet he’s making big bucks. I like this wee lottery. It’s only a pound and they sometimes send you free plays. A bit perplexed by the negative reviews on here. I won £100 on Boxing Day and then 10 months later I won £5,000 on their raffle! And everything they do for kids in Scotland makes this a much more worthy cause for us Scottish folks than the National Lottery! Love love love the Scottish Children’s Lottery. Not keen on that Jennifer Reoch though. Agnes, I enjoyed reading your review up until your last sentence. Jennifer Reoch is one of the loveliest girls on television, I much prefer her to Lorraine Kelly, to be honest. 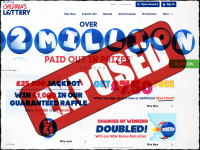 Good lottery – only a £1 to play and £25,000 to be won. Fun website and easy to buy a ticket. Over £3m raised for Scottish Charities – great result! Absolute scam taking money out my bank account when i clearly have NO SUBSCRIPTION, then not letting me close my account!!! Also claiming it’s all for good causes lmao that’s lies! Great fun lottery, I play every week and have won £25. And it’s Scottish. I have cancelled my subscription, as they took a direct debit on 26th September, then the next one on 12th October. They sent an email saying they made a mistake, but no subscription showing on my account, so they would no doubt have tried to take more money this week. I’m not giving them access to my bank account to swipe money whenever they want. If this was a salesperson at your door twenty times a day, year in year out trying to sell you lucky white heather, then it wouldn’t be allowed. Yet stv think it’s fine to bombard us with two of the most irritating people on telly. ( although Anita “the wee man” Manning is up there). One looks like it has been caught in the headlights, ingratiatingly bangs on about wee this and wee that and will no doubt be visiting a granny near you for tea and a wee scone. The other is a brazen, baw faced, hen taed, and knock kneed self loving pest. Qualities essential for lifting National titles it seems, even when the turnout that year is poor. I’m fed up hitting the mute button all day because these two pains. “It’s just a pound” “Git yer direct debi’ NOW” Yukk off, please. Have only ever won£25. They say one in six tickets is a winner, trust me to buck the trend, now 16 draws and no wins. Still it is a good company, something to do with STV. What do the bosses get paid? I love playing this lottery. You might not become a millionaire but £25000 is a tidy sum, it’s only £1 per ticket AND I’m helping charities for kids in my beautiful country … WINNER!!! How do I know which fast pick numbers i have been allocated before prize draw.